In 2015 (according to the National Interagency Fire Center), nearly 70,000 wildfires raged in the United States, scorching more than 10 million acres and racking up better than $2 billion in federal suppression costs. A wildfire may spark in the middle of huge wilderness from the lick of a lightning bolt; at a front-country campsite from a careless campfire; or within city limits when the spark from a car or a tossed-away cigarette alights the brush and weeds of an untended lot or roadside hedge. Wildfires can be terrifying and life-threatening. They don’t need to be terribly large to become essentially uncontrollable, and many of the biggest yearly blazes only die down with the help of Mother Nature in the form of sustained rainfall or snow—though wildland firefighters across multiple agencies do an amazing job protecting lives and property. Here are some tips on wildfire preparedness any homeowner would do well to take to heart. Wildfires are on the increase in the U.S., as they are in many parts of the world. The reasons aren’t cut-and-dried, although global warming is almost assuredly playing a role by, for instance, enhancing drought and proliferating tree-killing pests and diseases. And the historical American policy of essentially blanket wildfire-suppression has also made many landscapes—evolved over millennia under the influence of occasional scorching—more vulnerable to bigger burns: woodlands, savannas, shrublands, and grasslands once regularly flushed by low-intensity wildfires have in many cases become overgrown with trees or brush, making a much larger fire more likely. Keep in mind that, while we often colloquially refer to “forest fires,” wildfires can and do occur in non-forested habitats. Brushfires and grassfires can be swift and ferocious, threatening structures far removed from the nearest timber. Furthermore, wildfires may break out in rural and even urban settings. Among the people most vulnerable to wildfires are those who inhabit what’s called the wildland-urban interface. This describes the overlap zone between developed, human-dominated areas and wilder, undeveloped country. Millions live in these threshold landscapes, not least because they directly appeal to many homeowners eager to reside on the edge of countryside or wilderness. These homes are often located in fire-vulnerable settings such as canyons, shrubby or forested foothills, and enclosed woodland. If this describes your HQ, it’s incumbent to make your home and property as fire-resistant as possible—and to develop an emergency plan of action in case a blaze breaks out in or advances into your vicinity. The National Fire Protection Association (NFPA) oversees an initiative called the Firewise Communities Program aimed at educating homeowners about steps they can take to make their households safer from wildfires. The Firewise website is an absolute must. We strongly urge you to take advantage of the many resources it provides. The first step in converting your domicile into a Firewise one is assessing your so-called “home ignition zone”: the area 100 to 200 feet around (and including) your home that may cause it to catch flame via embers, brands, or simply radiant heat. That home ignition zone is your defensible space, and you want to make it a buffer less likely to fuel and/or carry a fire. It’s a good idea to begin your Firewise effort with your home itself: the most important part of your property, after all. Keep your roof and gutters clean, as accumulated leaves, twigs, and other debris can combust from a mere ember. You also want to make sure to fix or replace any busted or missing tiles or shingles, as the gaps they create can allow embers to enter your house. Vents can serve as similar entryways for flaming material, so consider guarding them with wire mesh. Decks and patios can be significant avenues for fire. Remove material from underneath and alongside them, and blockade the crevices beneath with mesh or some other material so debris doesn’t build up. The NFPA recommends keeping a “fire-free” radius within five feet of your house. Eyeball the exterior walls of your home, and you’re more likely than not to see something combustible leaned or stored against them: woodpiles, lumber, compost bags, brooms, etc. And that’s not even including plantings. Remove flammable items and consider replacing vegetation or mulch with hardscaping: gravel, pavement, and the like. Beyond the immediate radius of your house, consider planting trees, shrubs, and herbs that are less likely to violently combust in a fire. The Firewise website has links to state/region-specific references on fire-resistant landscaping. Space out trees and shrubbery: For instance, within 30 to 100 feet of your home individual trees should be separated by 20 feet and tree clusters by 30 feet. And you want to prune your property’s trees so they’re free of branches six to 10 feet from the ground. Such low-hanging boughs are what firefighters and foresters call “ladder fuels” for their propensity to carry a ground-hugging flame into the canopy. Just as critical as Firewise home maintenance and landscaping is developing a sound fire emergency plan for your household. This should include assembling the sort of emergency kit we’ve discussed here at the blog before—including an adequate supply of non-perishable provisions such as Mountain House meals! In the case of a fire, you may well be forced to evacuate with little advance notice, so you’ll want an emergency kit designed as a “go bag” that can quickly be grabbed on the way out the door. In addition to food, water, first-aid, and other survival essentials, it should include backups of any prescription medications as well as copies of critical documents. You’ll also want an emergency kit stowed in your vehicle in case you need to evacuate by car, or you’re blocked from returning home by a wildfire. Your wildfire evacuation plan should specify at least two and ideally more escape routes from your home and neighborhood, in case an oncoming inferno blocks one or more exit points. Everyone in your household should be familiar with the fire preparedness plan, and it should include evacuation and other emergency-protocol details for workplaces, schools, and anywhere else family members spend time. Program emergency numbers into everyone’s cell phones. You also want to refresh yourself as to your homeowner’s insurance policy and inventory your home’s content ahead of any potential wildfire. You can be the most diligent Firewise homeowner out there, but your wildfire preparedness may end up being for naught if your neighbors aren’t as responsible. Educating your neighborhood about fire-resistant landscaping and home preparation is an excellent first step in coordinating communal safety efforts. You’ll all be more secure and better-prepared if the entire neighborhood keeps tabs on the local risks of fire. That also means making sure street signs are clearly visible (for emergency responders), and having a sense of who’s most vulnerable in your community—for example, the elderly or infirm. The most important instruction if a wildfire’s in your area is to heed any and all evacuation orders. If such haven’t been issued, take other anticipatory steps: Besides doing another once- or twice-over of your defensible space to get rid of or more safely away from any combustible material, the Federal Emergency Management Agency (FEMA) recommends attaching garden hoses of suitable length to reach all parts of your home and filling tubs, bins, garbage pails, and other receptacles with water. Wildfire is nothing to play around with. 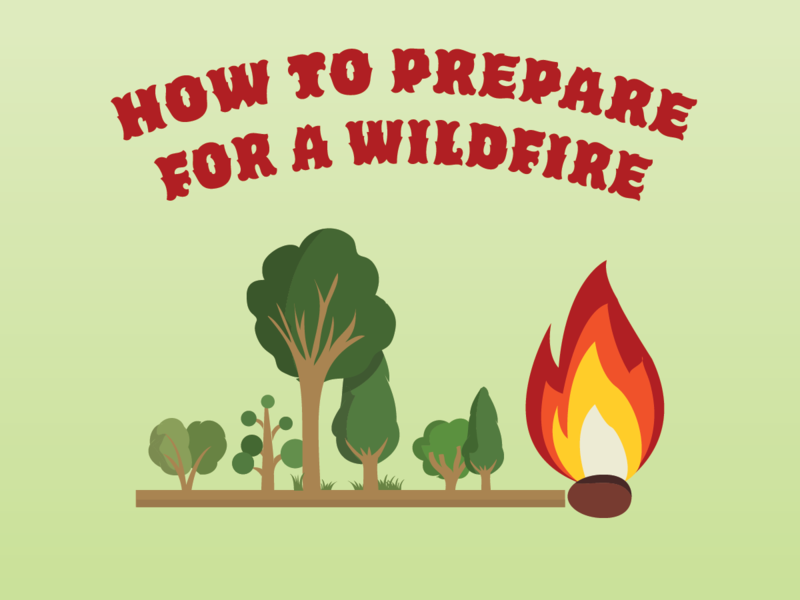 Check out helpful wildfire-preparation resources such as FEMA and Firewise, and prepare—and practice—a fire emergency plan for your household! This entry was posted in General, Survival and tagged emergency prep, emergency preparedness, just in case, survival by Kelli Martinelli. Bookmark the permalink.